Warning: This story contains spoilers from the latest Star Wars Rebels episode, "Twin Suns"
The final moments of the most recent Star Wars Rebels episode, "Twin Suns", are some of the most discussed moments of the series. 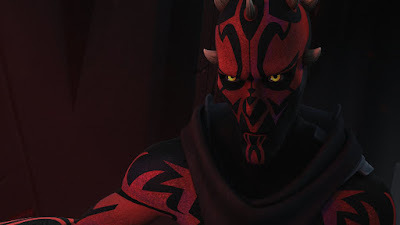 The episode featured the final showdown between Obi-Wan Kenobi and Darth Maul on Tatooine, with Kenobi finally finishing the job he started back in The Phantom Menace and killing Maul. iO9 recently spoke with Rebels co-creator and executive producer Dave Filoni about "Twin Suns" and Maul's ultimate fate. "We have to look at every episode of Rebels as if you’ve never seen Star Wars before. So if you think of it that way whenever Maul and Obi-Wan are talking about ‘The Chosen One’ or ‘Who are you protecting?’ if you never see or we don’t give the context of that, there are a lot of people who won’t know whats going on there. The Star Wars fan will but the average person will not. So at the very least the scene establishes, in its simplest form, there’s Obi-Wan, he was protecting someone, and there’s a woman yelling ‘Luke,’ and we see what we think of as a young boy running. ‘Oh, so Obi-Wan is protecting a boy named Luke.’ It’s designed to give you that specific bit of information that you need in the story." You can read the entire interview with Filoni over at iO9.